Pension Haus Sanz is located in a green residential area easily reachable from the A2 and A23 motorways. The Vienna State Opera is reachable by tram in 25 minutes. Free parking is possible on the street. All rooms are soundproofed and have a private bathroom, satellite TV and offer views of the garden. 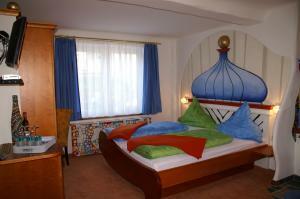 Some rooms are styled according to specific themes like the Alps or Hundertwasser. Free wired internet is available in the public areas of the guest house. A buffet breakfast is offered in the breakfast room featuring a little waterfall. During the warmer months you can spend some relaxing time on the garden terrace of the Haus Sanz. A fitness centre can be reached on foot within 5 minutes. The City & Country Golf Club am Wienerberg is a 5-minute drive away. Within a 3-minute walk you can reach the Badner Bahn tram stop and in 7 minutes the Erlaaer Straße stop of the U6 metro line.